Publisher: Ruth Nyaboe March 29, 2017 This information is provided solely as a guideline. Almost Lunchtime and don't want to eat fatty foods? We got you covered. 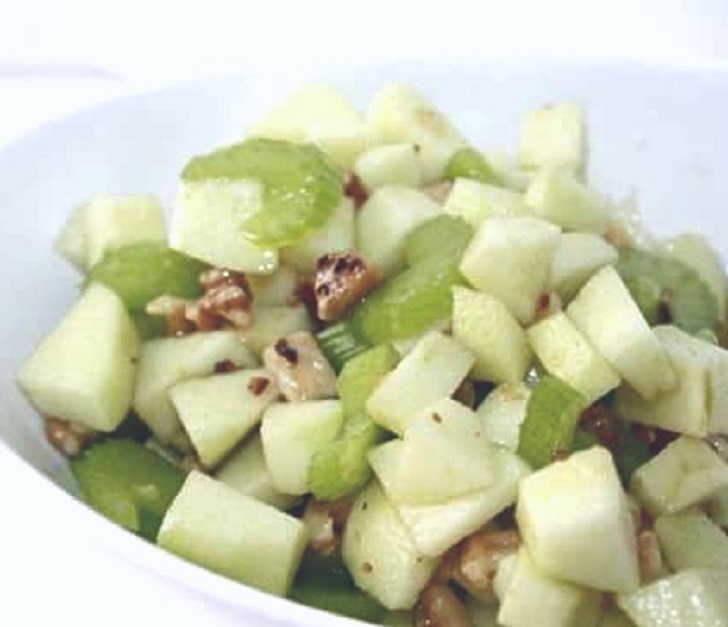 ➦2 or 3 diced Green apples. ➦³/₄ cup nuts (any type without skin is better). ➦²/₃ cup extra-virgin olive oil. ➦salt and pepper to taste. Slice apples. Peel, cut into quarters, cut out the core, thin slices. Prep celery. Separate ribs, wash, cut off the tough bottom 2 inches. Slice celery into thin slices on the diagonal. slice leaves too. they're good. Toast nuts in a small pan on low heat. stir regularly. take off the heat as soon as they're toasted (optional though). In the large bowl, make the dressing. You'll make it in the bottom of the bowl, then toss the salad in it. All dressing ingredients, except the salt and pepper in the bowl, Whisk it until it's really well-combined taste a little on a piece of celery. If it needs salt/pepper, add them. Add celery, apples, and nuts to a bowl.